Short break specialist tour operator for more than 30th years. 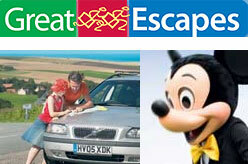 Great Escapes offers over 30 destinations (including Bruges, Paris, Lille, Champagne – Reims, Le Touquet and more) worldwide. City breaks, touring options, family friendly breaks plus a choice of travel options including train, ferry, Eurotunnel, no-frills and scheduled airlines and over 130 hotels. Fareham, Hampshire PO15 7AN, UK.